This is a favourite of mine. It’s small, or compact might be the word, when closed up – it almost fits in your pocket. It certainly fits in a coat pocket. Yet when extended to operating length, it’s long enough to be impressive, but above all it works well. So it is the ideal telescope to use on holiday. 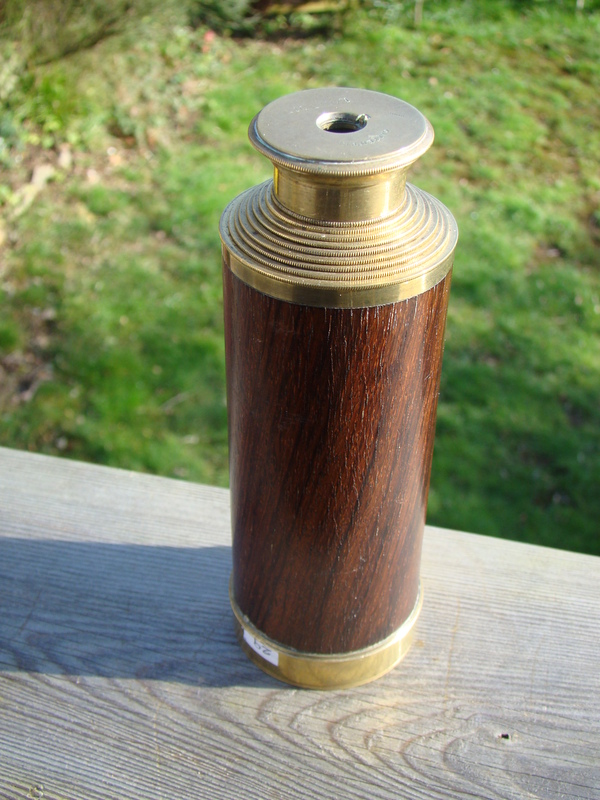 There is a rosewood veneer over the (presumably brass) barrel. This contains eight brass draws, all just above 3” (8.2cms) long. The outer diameter is about 2”, and the closed up length 5.5”. There is no sunshade, and no lens cover over the objective, that is probably missing. The eyepiece has a flat end, with a sliding cover over the aperture. 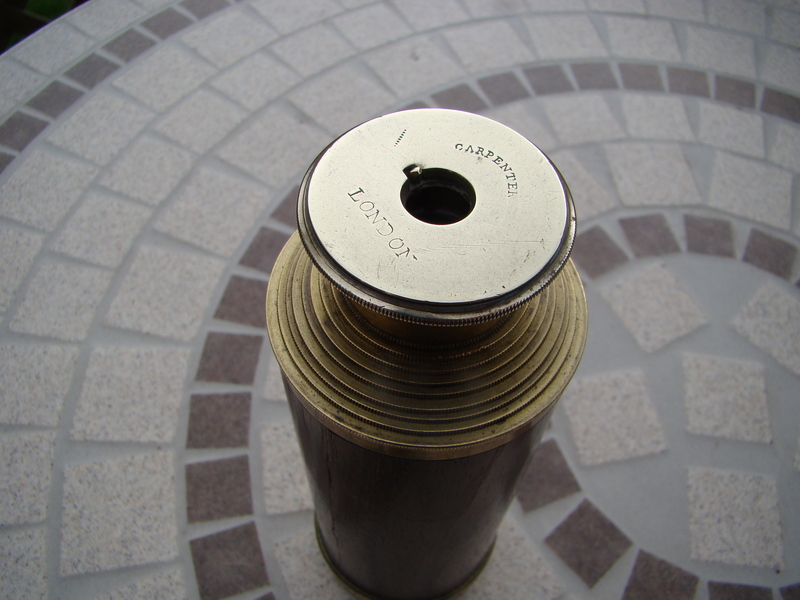 On the flat end of the eyepiece the engraving says “CARPENTER – LONDON”: while the word London is fairly even, on a straight line, the “Carpenter” is on an arc, not quite centred on the centre of the eyepiece, with varying weight/punch angle and quite unevenly spaced – as if done by hand, unevenly. Over to the left there are a number of dots in what seems to be a vertical line – with eight dots it looks deliberate, rather than an accidental mark. Incongruously, this line of dots is absolutely in a straight line. Maybe this indicates the eight draws of this model? In use, the extended length overall is 27”. The second set of eyepiece lenses are at the end of the second draw, so focus is adjusted from the second to third draw, keeping the first draw fully extended. This telescope was found at the Scientific and Medical Instruments Fair, at the Portman Hotel in London, 29th October 1995. Surprisingly, it was filthy, with the wood looking very tatty, and dirty lenses. The supplier was Alan Jones (Nautical and Scientific Instruments) of Plympton and Plymouth, PL7 5AS. It was still expensive – a marked price of £185 was knocked down to £170. Admittedly it is quite an effort to dismantle all the pulls to clean them. The most satisfying results of cleaning were seen with the rosewood veneer, after stripping off the original polish it was cleaned with linseed oil and turps, then polished with beeswax and more linseed oil. The Carpenter family story seems to start at around 1808, with William and Philip Carpenter working in Inge Street, Birmingham. In 1826 Philip Carpenter opened in London, and in 1827-33 he was at 24 Regent Street, at the corner of Jermyn Street. Interestingly, Gloria Clifton quotes him as making kaleidoscopes, microscopes and microscope accessories. He died in 1833, and from 1834-37 his sister Mary (quoted as an Optician) ran the business at this address. From 1837 onwards Mary went into partnership with William Westley, and Carpenter and Westley continued through to 1914. Certainly from 1828 up till 1835 there was a factory in Birmingham supplying the Carpenter London shop, but apparently Carpenter and Westley re-sold stock from Negretti & Zambra. There were also some other instrument and toy makers in Birmingham named Carpenter at this time. 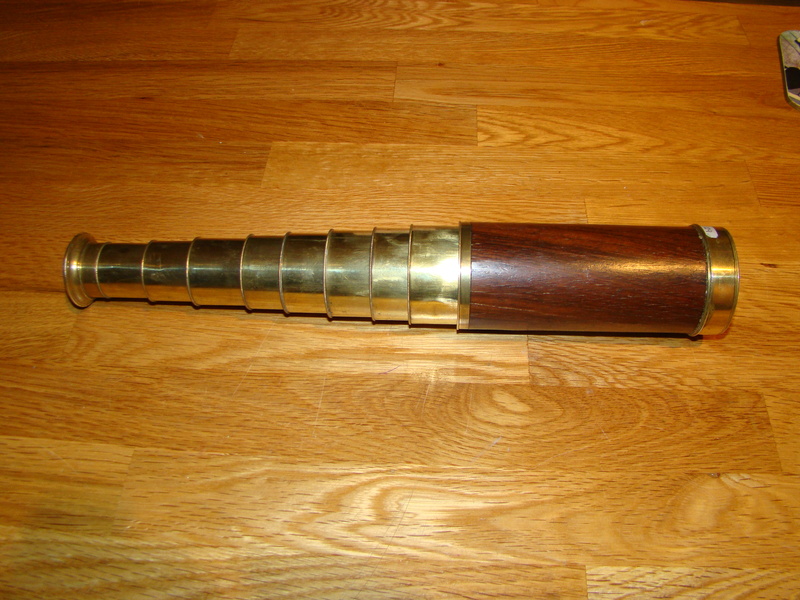 So it is likely this telescope with the Carpenter name, and from a London shop, was produced between 1826 and 1837. Because this is a very compact telescope, it would have been attractive for use by Cavalry officers or land troops in charge of artillery etc. But presumably the Regent Street shop (I assume) was chosen to attract attention from the wealthy shoppers passing by, which might have been land owners visiting London. So the target market might have been more for the gentry to use on their travels, or their country estates. 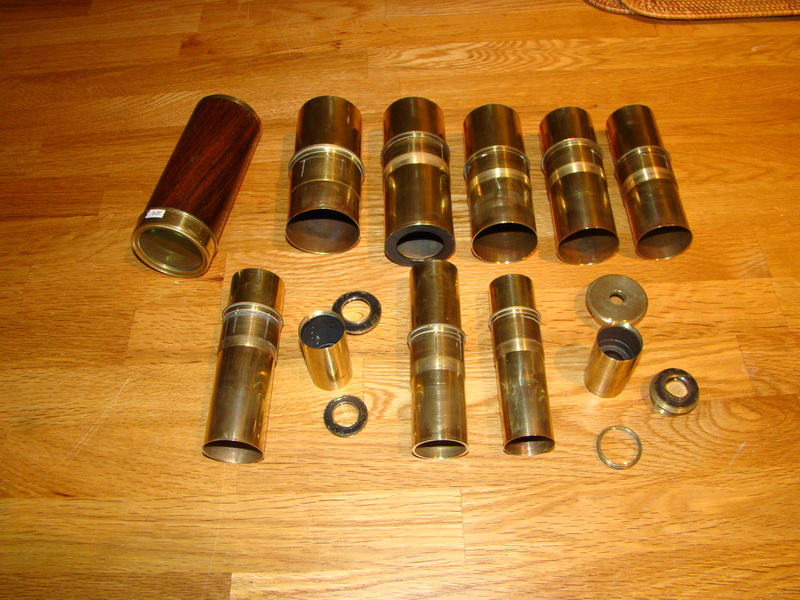 The two draw Ramsden and Berge telescopes made in the 1790s probably pushed the designs of the time as far as they could go, in relation to the availability of different sized accurate tubing, which had to be both smooth on the outside and circular in section: so piping constructed with a welded or brazed seam was not suitable. But then we have the Watkins telescope from 1890, which was the previous one listed on here, with a long four draw design. In the early 1790s and 1800s such tubing in different sizes was becoming available, and probably operating from Birmingham factories the Carpenters were aware of the latest materials and machining techniques. Presumably in this era a major industry had developed, producing the rifles, cannons, and ammunition, maybe also later on pistols, with shell cases etc in brass, all of which stretched the gun drilling and tube boring technology. So I see this Carpenter type, from 1830, as taking advantage of the materials then available, and skilled enough in machining to not be daunted by the task of producing all the threads and fitments! There are other manufacturers who possibly produced such multi-draw telescopes, even Dollond, but unless we guess from the type of script used on the side of the Dollond scopes we have no easy way of dating them! While probably not the first multiple draw telescope, it does enable the owner to boast about the obvious skills of the machinists! Beware! If you carry the telescope in your hand luggage, as is the sensible thing to do, the Security people with X-ray machines are a little confused as to what the object is, when they see several concentric tubes linked together in what looks like a hand grenade sized object! Strangely the security guards I met had never seen anyone carrying a telescope before, I thought it was quite a normal thing to do. 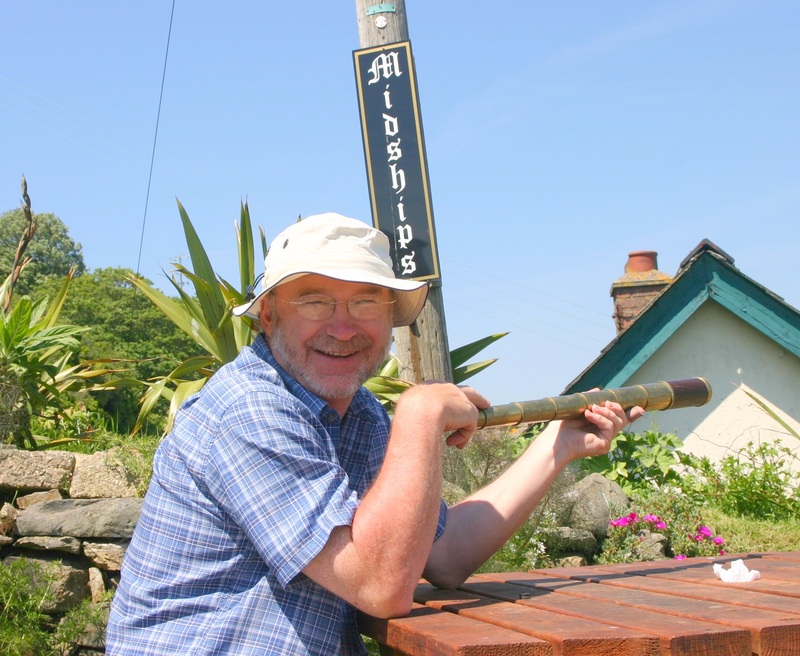 This telescope also regularly comes away on holiday within England, it easily fits under the car seat. Most of its trips take it back to Cornwall. Probably £250-300 only: it is accession number 29. I just like the design so bought another similar one, which I must find, but I don’t think the second one is named. No, it isn’t named, it is number 156. It is the same length as the Carpenter when closed, but much larger diameter, so not so pocket friendly, and heavier. The Carpenter weighs 600 gms, this other one weighs 820gms. It has 9 draws, or maybe 8.5, because the first one seems to be an afterthought to get the lenses in the right place! Its also fully lacquered, which I don’t like, and lacking a leather cover on the barrel. So buying another was obviously a mistake!